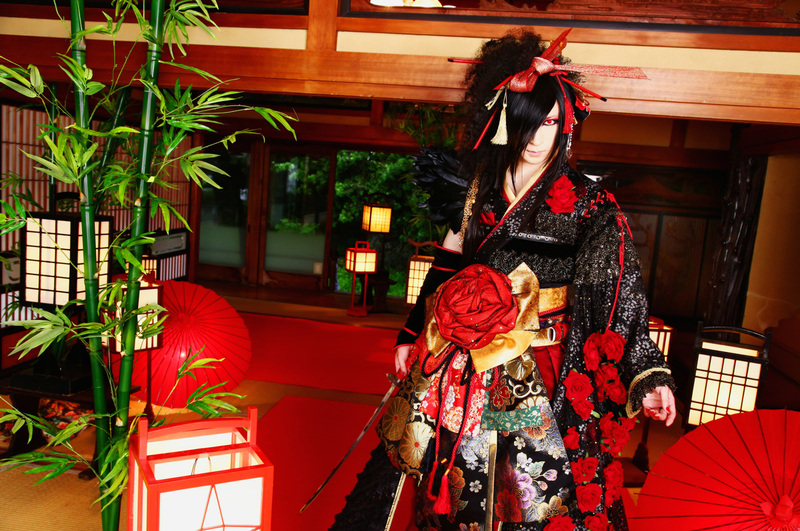 Asagi, el carismático vocalista de la banda visual-kei D, ha revelado la portada y un breve adelanto del esperado primer álbum de su proyecto en solitario, titulado "Madara", que estará disponible a través del subsello HPQ de la discográfica AVEX a partir del 31 de enero. Ametsuchi Iki Kuru Kofune (天地行き来る小船) feat. Shinya (LUNA SEA), Tomoko y Motoki (HEAVENESE). Gekkai no Miko (月界の御子) feat. Sakito (NIGHTMARE / JAKIGAN MEISTER), Hitoki (Kuroyume / Creature Creature), Shinya (LUNA SEA) y Motoki (HEAVENESE). Kashikoki Umi e Kaeryanse (畏き海へ帰りゃんせ) feat. Sugizo (LUNA SEA / X-JAPAN), Yoshitsugu (Eins:Vier / Alcana / Yohiaco) y Hajime Okano. Hanagumo no Ran (花雲の乱) feat. DAITA (BREAKING AROW / BINECKS / ex-SIAM SHADE), Hide-Zou(D), Hajime Okano y Junji Tokai (Kiryu). Onuzakura (隠桜) feat. K-A-Z (Sads / DETROX / STEALTH), Kanade (CrowxClass) y AKI (Sadie / AXESSORY). Keika (螢火) feat. Saga (A9), Chisato (PENICILLIN / Crack6), Shinya (DIR EN GREY) y Tomoko (HEAVENESE). Ooyama Inu Dake～Tsukuyo ni Hoeyu～ (大豺嶽～月夜に吠ゆ～) feat. You (Janne Da Arc), Hiroki (D), SHUSE (†яi￠к / La’cryma Christi), Tomoko Motoki (HEAVENESE), Jui (GOTCHAROCKA / Vidoll) y Yo-ka (DIAURA). Kumo no Kayohiji (雲の通ひ路) feat. HIRO (La'cryma Christi / Creature Creature), Hitoki(Kuroyume), Sakura (Gibkiy Gibkiy Gibkiy / Rayflower / THE MADCAP LAUGHS / ZIGZO / ex-L'Arc~en~Ciel) y Tomoko Motoki (HEAVENESE). Hakumenkonmou Kyuubi no Kitsune Hidama (白面金毛九尾の狐火玉) feat. Tsunehito (D), MOTOKATSU (Mad Capsule Markets / Ace of Spades), HIRO (La'cryma Christi / Creature Creature), Tomoko y Motoki (HEAVENESE). Kimera (鬼眼羅) feat. Leda (Far East Dizain / ex-Deluhi), MiA (Mejibray), TOSHI (Gargoyle), LEVIN (La'cryma Christi), Jui (GOTCHAROCKA / Vidoll) y Yo-ka (DIAURA). Fuyutsubaki～Shirotae no Kenin～ (冬椿 ～白妙の化人～) feat. JUN (GOTCHAROCKA / ex-Phantasmagoria), Toya (GOTCHAROCKA / Charlotte), Hajime Okano y TERO (†яi￠к / Vidoll). Youtou Gyokuto (妖刀玉兎) feat. Shinya (LUNA SEA) y Tomoko (HEAVENESE). Mononoke Soushi (物の怪草子) feat. Ruiza (D), SYU (GALNERYUS), You (Matenrou Opera), Junji (BULL ZEICHEN 88 / ex-SIAM SHADE), Motoki (HEAVENESE), Jui (GOTCHAROCKA / Vidoll) y Yo-ka (DIAURA). Asagi Madara (アサギマダラ) feat. Aie (The God and Death Stars / Gibkiy Gibkiy Gibkiy / THE MADCAP LAUGHS / KEEL), Yukino (Deadman), Sakura (Gibkiy Gibkiy Gibkiy / Rayflower / THE MADCAP LAUGHS / ZIGZO / ex-L'Arc~en~Ciel) e Ikuro Fujiwara.